Simply put: The Immortal Rules is Julie Kagawa’s best novel to date. She merges a strong heroine, two kinds of vampires (one dark and complex, the other zombie-esque), a fight for humanity and anti-authoritarian overtones in a masterful way. Protagonist Allison begins this story as a human living in on the fringe of a vampire-run society. Humans can register with the vampires and in exchange for required blood donations, they get access to food. However, that means the vampires own you. Allison isn’t having that. As an unregistered, she needs to scavenge for food and fight to maintain her home. She lives with three others and they work together to keep the group safe. But as things get tense, she’s willing to sneak outside the city walls into the ruins of suburbs to find food. That means dealing with the rabids. The rabids are mindless vampires attacking on sight. They’re quick and dangerous. I don’t want to give Allison’s journey away, but as it’s included in the back cover copy, I’m going to tell you something that happens a quarter of the way in: Allison gets turned into a vampire. The one thing she hates. The thing she fights. The thing she wants to kill. And the emotional journey of a young woman accepting her new reality as a monster and fighting to retain her humanity is done with power, care and blinding honesty. Kagawa writes Allie’s journey in such a way, you’ll imagine yourself fighting to keep the Hunger at bay and longing for someone human to still trust you. If you like your books dark with young women worthy of admiration, The Immortal Rules will strike a chord with you. And even if you haven’t dived into the post-apocalyptic and dystopian trend, you need to read this one. I couldn’t agree with you more, Chelsea! This book hit all the right notes with me – from the setting (EEEE!BROKEN CITIES!) to the characters to the choices Allie had to make – and I am IN LOVE with it. Yeah, I think I’m going to go buy this right now. I love books that keep me up all night reading. Honestly, it’s a good YA/adult crossover. Sure there’s the natural coming of age element, but this one is stellar regardless of reader age. I’ve only just started this story, but it’s been great so far. Love the review. I just received mine in-my-mailbox yesterday!! Squeeeeeeee! Cat and DeAnna – Thanks! I’m almost finished. Less than 100 pages to go. Being a fan of her Iron Fey Series, I have to say I was shocked with the difference between the two. 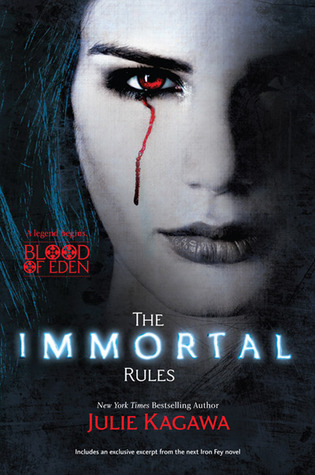 Immortal Rules is a much darker novel — but I like it. The way she describes the scenery is dull and lifeless but I think that reflects the period and lifestyle. I will admit that it took me a while to get into it. I think that was because I was expecting something different. But once I accepted where the author was going, I couldn’t put the book down. Her writing is fantastic! You really get lost in the story. Honestly I don’t really care about vampire books, but after I read the excerpt, I know I have to read The Immortal Rules. I’m a little late on this subject, but I’m really struggling with this book.I’m only to where Ali meets Zee and it seems to have dragged on and on. I can’t stop reading but my mind seems to have gone numb with this journey to find herself.